Where other lenders can only offer limited choices, Grove Mortgage provides an extensive suite of jumbo and super jumbo loan options. You can choose from a wide variety of rates and terms, including interest only payments and fixed or adjustable rate programs. Jumbo loans are mortgages that are over the conforming industry standard or what is know as the conforming loan limit. Currently starting at $484,350 and may be higher in some geographical areas to $650,000 and for a Super Jumbo an amount over $650,000. 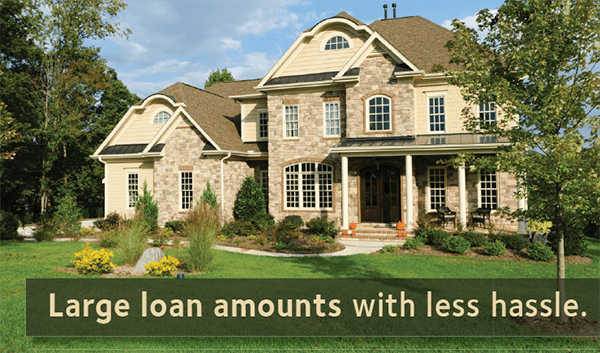 Jumbo VA Loans offer the best financing option for Jumbo loans if you qualify for a VA Home Loan. These loans are bought and sold on a smaller scale. They often require a larger down payment percentage and carry a larger credit risk for the lender so the interest rate is typically higher than a conforming loan that is under the conforming loan limit. These special loan programs have a number of different terms available for them. Including 15 year, 20 year and 30 year terms. Jumbo loans and Super jumbo loans can be fixed rate mortgages or adjustable rate mortgages and have a range of terms to accommodate short and long range financial plans. Why choose Grove Mortgage for your Jumbo home loan? We are an Independent Mortgage Broker and have many lenders that we can shop for the best jumbo rates for you. For Jumbo Loan Rates Please contact us for we can give you a personalized home loan quote! Refinancing your current Jumbo loan allows you to take advantage of lower mortgage rates or to shorten or lengthen the term of the loan. There are may options available, please call us and we can go through them with you. Refinancing your current loan can allow you to remove cash from your home to be used for other things. We offer both fixed and adjustable loan options.